Your Simatic S5 or Simatic TI control system has served you well for many years but as time goes by you are finding that it is more and more difficult to locate replacement parts and technical competency for your products. When should I make the transition to new technology? How do I make that transition and will it hurt? Where will the transition be made? What impact will this have on down time and how much will it cost? Who can help me with the transition? These are all good questions, and LT Software Solutions makes the answers clear. When: The time to make the transition is sooner than later. The search for replacement parts and someone who actually knows what to do with them is only going to get more difficult. Even though Siemens does an excellent job of supporting mature products (Probably better than anyone else in this industry) the bottom line is you are just not going to be able to fine those replacement parts and talent forever. How: Making the transition to Simatic S7 products is actually easier than you might think. 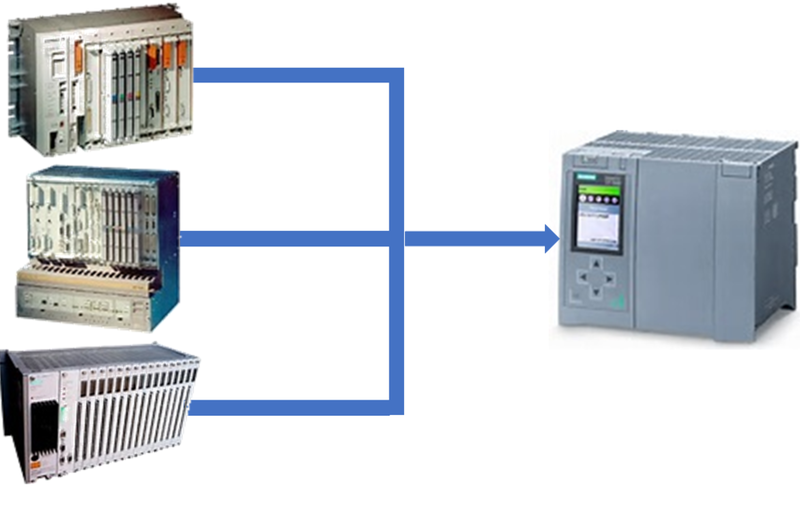 Siemens has done their homework as far as it relates to maintaining your I/O investment. The extensive I/O communications capability of Siemens PLCs will allow you to keep most of your I/O investment in place, while taking advantage of the more capable Simatic S7 CPUs. As far as the base software is concerned, in some cases the transition can be easy. Siemens provides conversion software that does a good job of making a first pass of the conversion of your program and will allow many of your existing S5 or TI Ladder Logic programs to be moved to an S7 application. As long as the source application is simple ladder logic the initial portion of the conversion is actually quite painless. Where: In most cases LTSS can migrate your system to current technology in our facility which will grately minimize your downtime for startup. What: Impact will this have on down time. The MTBF (Mean Time Before Failure) of the current technology automation equipment continues to increase which means that once you upgrade you will experience less down time due to Control system Failures. Who: LTSS can work with you to either guide you through the upgrade process or we can handle the complete upgrade for you directly. By just replacing your processor and main rack as an initial step you can minimize your transition expense. As budgets allow or as your plant expands you can choose to upgrade additional portions of your system to the latest Siemens technology. Once you have made the transition to the Siemens Step7 programming environment you can then take advantage of a complete software support structure that will handle all of your Siemens S7 programming requirements.